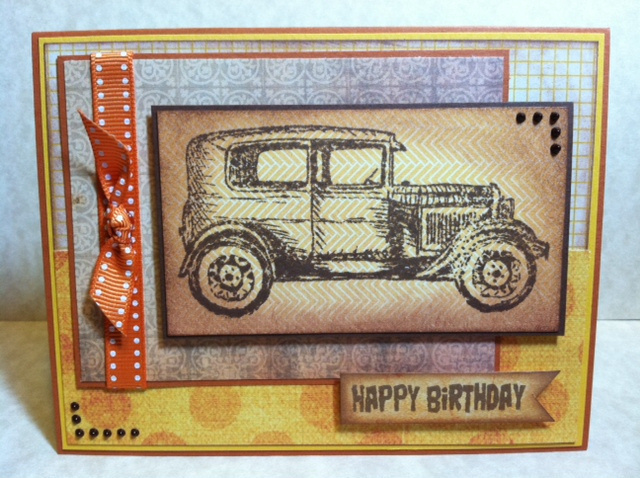 For this card I used Pink by Design "Birthday Birthday" stamp set for the sentiment and "Ahooga" for the car stamp. Maybe this technique will be old to you but it's new to me! I've recently discovered colorless stamping! This is where you stamp on a piece of subtle patterned paper. 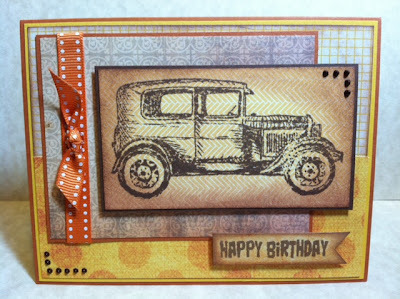 I also LOVE to ink so I inked in a light brown around the car and around "Happy Birthday". i love this card chick!! I can't wait to use my Ahooga stamp set!! My hubby is restoring a car JUST LIKE IT!! Very cool card, love it! !